Lisa Murray and Brenda Harden lead the competition in the Chamber’s “Brown Jug Race” Tuesday. 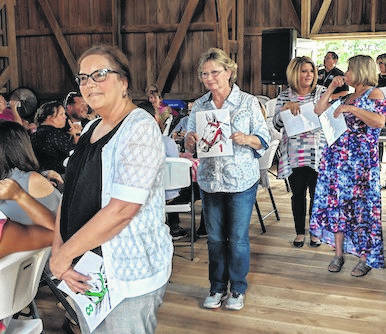 CHESTERVILLE — The rafters rang with laughter and conversation at Kate and Jeff Stuttlers’ Heritage Barn last Tuesday as 74 Chamber of Commerce members had an hour off from work to network and bask in the sunshine and country atmosphere. New members welcomed by Chamber Director Shelley Planey included: Karen McClelland of Sames & Cook, Annette and Drew Cottrell of Mane Attraction, Bresco Broadband’s Matt Stimmel, Judge and Sharon Hickson, Mount Gilead Village Veterinary Clinic, and Megan Hammond of Life and Style Printing. Chamber President LeAnne Gompf introduced a “Brown Jug” race game in which a dozen members participated. The prize was several VIP tickets to the Little Brown Jug race in Delaware that were donated by Consolidated Cooperative. The “race” was won by Lisa Murray, who graciously declined because she is director of the publicly funded Cardington Library. Second place winner Matt Ferrell was happy to get the prize tickets to the race. The speaker, Mike Schnell of radio station WVXG, talked about the importance of branding in advertising. He called radio the “theater of the mind” and stressed that radio should be a part of the mix in advertising with newspapers, direct mailings and television. Planey announced upcoming Chamber activities and events for fall that include: Coffee Chat for planning on Monday, Sept. 24 at 7 a.m. at Sames & Cook; Christmas Parade and Celebration planning will meet at the Mount Gilead Public Library on Sept. 24 at 6:30 p.m.; Regional Chamber Business Expo is Thursday, Oct. 18 at All Occasions in Waldo; Chamber Annual Dinner is Thursday Oct. 25 at 6 p.m. The Chamber Christmas Parade is planned for Dec. 7. “Light the Night with Musical Madness” is the theme. https://www.morrowcountysentinel.com/wp-content/uploads/sites/29/2018/09/web1_IMG_20180918_123709-1.jpgLisa Murray and Brenda Harden lead the competition in the Chamber’s “Brown Jug Race” Tuesday.